NASCAR racing veteran Rusty Wallace, who appeared flanked by representatives from NASCAR, Penske Racing South, Miller Brewing Co., Action Performance Companies Inc. and members of his family, today announced that the 2005 NASCAR NEXTEL Cup Series race season will be his last. Wallace is ending his career with Penske Racing South behind the wheel of the No. 2 Miller Lite Dodge, the car number and sponsor that have been inextricably linked to him for the past 14 seasons. In addition to the announcement, Wallace unveiled the official "Last Call" logo, designed by Action Performance, and a No. 2 Miller Lite/Last Call Dodge showcar that features many of the milestones from his storied NASCAR Cup Series racing career. Several guest speakers were on hand for the event, which took place at the NASCAR attraction Daytona USA. Each person reflected on Wallace’s notable career and his place in the NASCAR racing’s premier echelon. A career-spanning highlight film also was screened for attendees. A longtime licensor with Action Performance Companies, Wallace’s No. 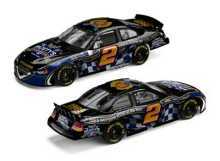 2 Miller Lite/Last Call Dodge also will be produced as a fantasy die-cast collectible. The replica will include all of the details and milestone notations as seen on the full-size showcar. "Rusty Wallace has been an important part of Action Performance Companies almost since our company began, as he was the first NASCAR driver to sign a license agreement with me in 1989," explained Fred Wagenhals, Action’s chairman, president and CEO. "While I applaud his career success and want to see him be successful in all of his ventures beyond the driver’s seat, it will be difficult knowing that 2005 is his ‘Last Call’ on the racetrack. Rusty embodies all of the things that you want to see in your favorite NASCAR driver: dedication, intensity, color and character. He also is a friend, and I wish him and his family only the very best." Rusty Wallace No. 2 Miller Lite/Last Call Dodge die-cast replicas will be available through Action Performance’s standard distribution channels, including Action Racing Collectables distributors and the Racing Collectables Club of America. To reach an ARC distributor, call the locator line at 1-800-411-8404. To join RCCA, call 1-800-952-0708 or www.goracing.com. The 2005 NASCAR NEXTEL Cup Series schedule is available for review online at www.nascar.com.